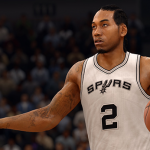 A new roster update has come through for NBA Live 16, featuring updated lineups and adjusted player ratings. Eleven recent transactions have been accounted for, and four new players have been added to the game: Alan Williams, Andrew Goudelock, Axel Toupane, and Sean Kilpatrick. At present, there are still thirteen players in the roster that are rated 90+ overall. J.J. Barea was the most improved player in the latest update, with the Western Conference Player of the Week’s performance over the past ten games leading to a two point jump to 79 overall. The April 8th roster also includes seventeen gear and accessory updates. For a full overview of the latest NBA Live 16 roster, check out this spreadsheet. If you’ve got any thoughts or feedback on the roster, post them in the comments section below, or join in the discussion in this thread in the Forum.